Gluten-Free Living (GFL) magazine and the Celiac Disease Foundation (CDF) have a shared vision: to promote the advancement of celiac disease research and spotlight celiac and gluten-free champions in our community. With this vision in mind, GFL is proud to introduce passionate and dedicated CDF Student Ambassadors from across the U.S. Below, meet Jillian Estell, a talented 14-year-old from Los Angeles who is increasing celiac awareness while raising money to help find a cure. Celiac Disease Foundation because I have had celiac disease my whole life. My mom knew I had celiac when I was a baby because I had a reaction when I started eating baby cereal. I have some family members who also have celiac so she knew immediately. I also decided to become a student ambassador because I wanted to make a difference. 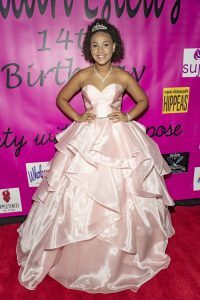 I am an actress and I thought, “I may be able to educate a wider audience and maybe have a greater influence [to raise awareness].” My role is to get the word out, to educate people, and one of the ways I’ve done that is by throwing a Hollywood red carpet birthday party to raise money and awareness for Celiac Disease Foundation. I hope to raise awareness and educate more people and restaurants about celiac disease. I love going out to eat, but it is very difficult since [many establishments don’t] educate employees or take precautions for [serving] people with food allergies. When I’m not working in my role as Student Ambassador, I’m an actress. I’ve been acting since I was 3 years old, including starring alongside Kevin Costner and Octavia Spencer in the movie “Black or White.” I also had a recurring role as Jennifer Beals’ daughter on the NBC show “The Night Shift.” I was a competitive cheerleader for six years, and now am a dancer.